Today we went to a restaurant for lunch. While on holiday we've been going to more restaurants than we usually do at home, so we've had to find some very creative ways to play and learn while we're out, to keep Ethan occupied and happy. 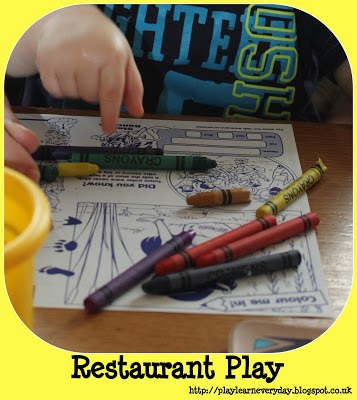 Many restaurants are great and they provide crayons and colouring sheets, which is fantastic! We have great fun colouring, asking Ethan to colour in certain areas or use certain colours, a great way of building his Creative Development while we're out. But that doesn't always keep Ethan busy for very long. We also find other (safe) things on the table for Ethan to play with, he loves sugar packets, menus, napkins, straws and cups...we even taught him to 'cheers'!